4 Bedroom Detached House For Sale in St. Austell for Offers in excess of £800,000. 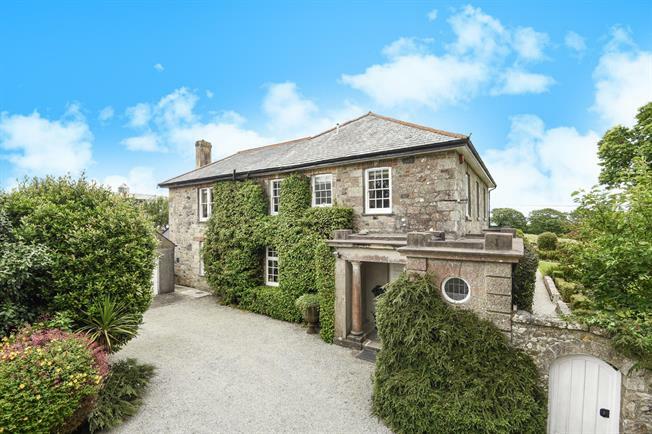 This property is arguably one of St Austell’s more prestigious homes located just on the outskirts of the town centre, situated in an elevated position towards the top of Menacuddle Hill. This fine and impressive Georgian Period House has been significantly updated and improved by the current owners during their ownership to an exemplary standard throughout. There is a wealth character and charm throughout the property with a mix of original features being preserved along with the current vendor re instating period features which now make for a seamless transition and bringing the property back to its former glory. On first impressions, the property’s open porch is flanked by two stone pillars and provides an outstanding entrance through a large timber door into a wide entrance hall complemented by timber flooring which also flows into other rooms along with the original large flagstone flooring on the ground floor. The impressive dual aspect sitting room provides a wonderful family room flooded with ample natural light through large sash windows. The sitting room has a marble surround fireplace as its central feature with a deep bay window which looks out onto the formal gardens. Doors then lead to the delightful sun room with large picture windows, flag stone flooring and an atrium style glass roof which makes this room an absolute delight in summer with light and warmth streaming through the abundance of glass. Also on the ground floor is the heart of the home, the kitchen. Updated in recent years the kitchen has a range of wall and floor mounted units with granite worktops in a traditional farmhouse style. The vendors have again managed to blend tradition with modern convenience with an inset range style cooker which is electric and there is also a breakfast bar. An appropriate addition to this supreme kitchen is the walk in larder with traditional slate shelving. Further to the ground floor living accommodation is the formal dining room with a feature fireplace and with ample space for a dining table to accommodate a minimum of 8 people. The dining room is accessed off both the inner hallway along with a useful door direct into the kitchen. The rear access door leads into a helpful boot room with numerous coat hooks and provides immediate access to the downstairs shower room. Both these rooms have original flagstone flooring which is ideal for those days coming in from working in the garden or using the swimming pool. Completing the ground floor accommodation is the downstairs cloak room and the lengthy utility room which also has flagstone flooring and with a range of useful floor mounted units and butler sink. The utility room has tall cupboards, one of which houses the heat recovery system and pressurised water tank. Rising to the first floor there are four bedrooms. Three double bedrooms are located on this floor, which are all generous in sizes and with high ceilings appropriate for most tall furniture and one of the bedrooms enjoys marvellous sea and rural views. These three bedrooms are serviced by the well appointed family bathroom. The master bedroom suite spans the length of the house measuring in excess of 39’ in total and has fitted wardrobes in two separate areas. This spectacular suite is triple aspect which enjoys light throughout the day and has the elevated position to enjoy the majority of the grounds including not only the formal gardens and paddock but also the far reaching rural vistas and sea views from its prominent position. The dressing area of the master bedroom is a of liberal size with ample space for suitable furniture and appropriate use for the room. The master suite is completed by the en-suite bathroom facilities incorporating an immaculate feature cast iron bath. The current owners have created an extremely useful attic space which is a fully usable area with laminate flooring, dedicated areas for different uses, bathroom and further storage room. As this was done for personal use the requisite permissions would be required to make this a habitable room. Externally, the property is approached through granite posts onto a gravel drive where the property sits proud in front of you. There is parking for more than 10 vehicles and an additional double garage. Gardens wrap around three sides of the property and have been manicured to exceptional standards. There are various seating areas throughout the gardens including two ‘Secret’ gardens which are both by a pond with a quaint bridge over. To the lower side of the property there is a paddock of approximately half and acre with easy access from the driveway and formal gardens. On the higher side of the house is a swimming pool which has a glass enclosure with its own heat recovery system making it very efficient. For those interested in growing their own produce there is a dedicated walled garden incorporating an orchard, green house and fruit cage. In all an outstanding property for the distinguished purchaser. The recently regenerated St Austell town centre is situated within easy reach and offers a wide range of shopping, educational and recreational facilities. There is a mainline railway station and leisure centre together with primary and secondary schools and supermarkets. The picturesque port of Charlestown and the award winning Eden Project are within a short drive. The town of Fowey is approximately 7 miles away and is well known for its restaurants and coastal walks. The Cathedral city of Truro is approximately 13 miles from the property and provides a more comprehensive range of retail, banking and schooling facilities as well as being the County town. The property is located within a 10 minute walk from the town centre and also easily accessible to the main line railway station and local bus routes. The following services are available Mains electricity, mains water supply, private drainage, oil central heating and telephone connection although we have not verified this.